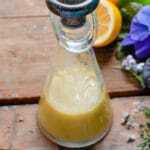 Homemade Meyer Lemon Salad Dressing Recipe - 5 ingredients! Making homemade salad dressing is quick, easy and superior in flavor. Homemade Meyer Lemon Salad Dressing uses five simple ingredients including seasonal fresh Meyer lemon juice, for a dressing you’ll want to put on all your fresh salads! 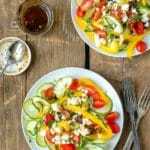 This recipe was originally published in May 2014 and has been updated in April 2018! I grew up in the iceberg lettuce era of salad. We all just accepted the complete absence of flavor as a given. As I began shopping from Farmer’s Markets as an adult I realized the vast world of lettuce available I’d never known existed. Fantastic colors and leaf shapes that actually have great flavor too. When visiting a friend in Switzerland a number of years ago I had a salad using only basil as a base leafy green. It seemed so strange but I loved it. It made me realize I was approaching salad with a bit of a trail horse mentality that I quickly shed. 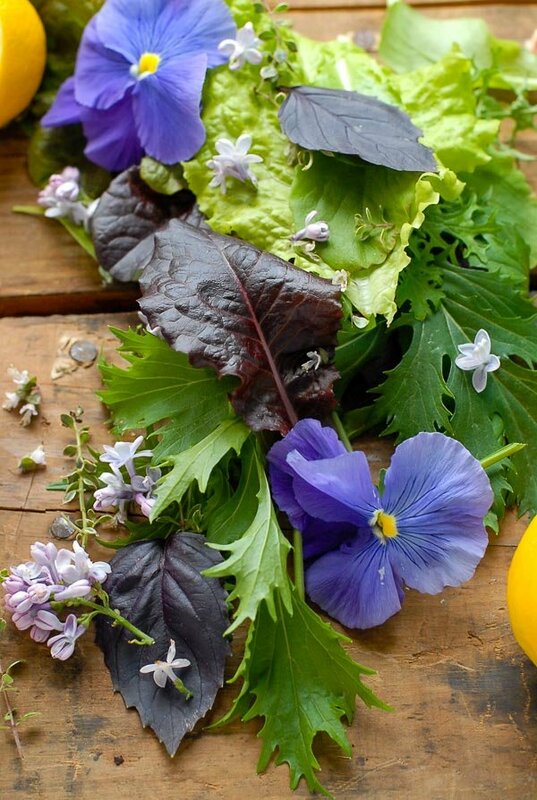 I love combining many leafy greens and flavor-packed herbs and flowers for a beautiful salad. Spring in particular offers many options for creative options! Of course using a great salad dressing is a must. With the fire stoked and heat turned high as our Rocky Mountain spring weather often demands, I made this bright, light dressing that kisses springs greens leaving them tasting like a sunny day! Fresh Meyer lemon juice, a smidgen of sweet apple cider vinegar , extra virgin olive oil and a dab of Dijon. A bit of white pepper for good measure. Mmmmmm. TIP for Best Citrus Juicing: if you put a citrus fruit in the microwave for 10 seconds before juicing it, the juice yield will be greater! 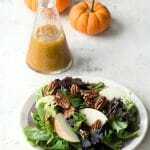 This salad dressing recipe uses fresh Meyer lemon juice specifically due to it’s sweeter, less acidic flavor. Meyer lemons are only available during the winter (usually December through May depending on where you live). Meyer Lemons are smaller than regular lemons, a bit deeper yellow/orange (some believe they are a cross between a lemon and mandarin orange) both in the flesh and skin. If side by side with a regular lemon the visual difference and flavor is noticeable. Why Make Homemade Salad Dressing? After kicking the boring salad situation I was reminded how crucial a great dressing is. 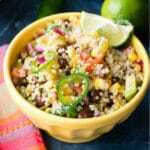 One that is not too heavy or with flavors that overwhelm the salad ingredients. Making dressing at home allows you complete control to season the dressing for your personal preference or change it to match your specific salad. 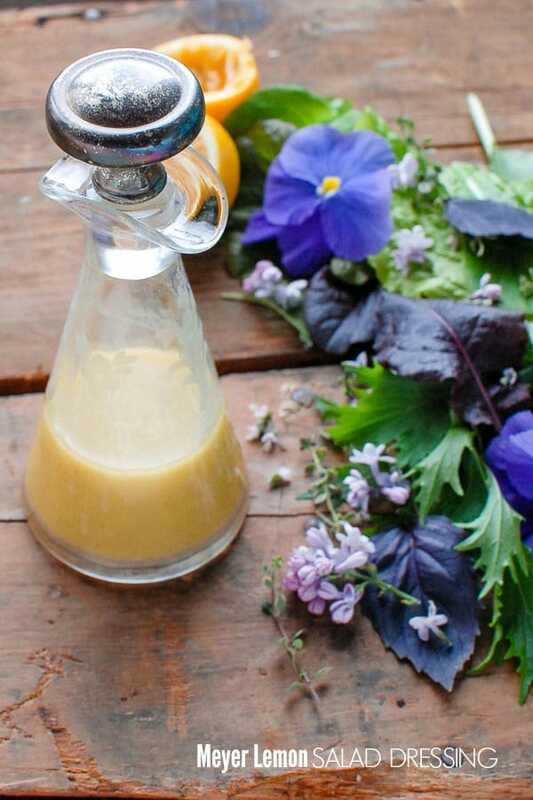 Homemade salad dressings are quick and easy to make. I’ve found since making my own, purchased salad dressings often have flavors I don’t love too. I never realized how simple making my own dressing is and I think once you try it you’ll be hooked too. Salad dressings don’t require fancy equipment . A citrus juicer: either handheld citrus reamer or counter type juicer (I use both). I often use small repurposed jars and salad dressing carafes are great to make and pour. Homemade salad dressing should be stored in a sealed container and may need to warm at room temperature before using leftovers. 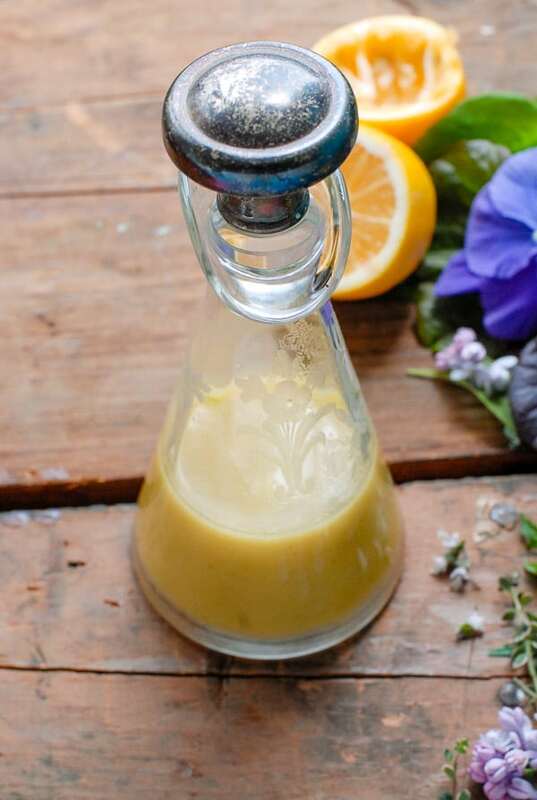 If you’ve tried this Meyer Lemon Salad Dressing recipe or any other recipe on BoulderLocavore.com, please don’t forget to rate the recipe and let me know where you found it in the comments below, I love hearing from you! I love lemon! I can’t wait to try this on salads! This sounds like it has so much flavor! I love making dressing from scratch, I’m going to have to try it! I need to get my hands on some meyer lemons so I can make this asap! Homemade salad dressing takes salads to a whole new level. I grew up in the iceberg era too so I know exactly what you are saying! Lovely dressing! This dressing looks so delicious and super refreshing! I love the taste of a meyer lemon! 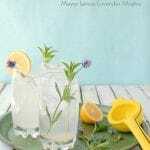 I love anything made with lemons and this looks and sounds delicious! I would love to make this for my family sometime. Thanks for sharing. Of this dressing just screams spring! So delicious and refreshing – and bonus that I have all these ingredients in my kitchen already! hey Toni, I like Basil. My girlfriend likes it to. It sounds awesome. I love light dressings especially when the weather starts to get warm. This one’s a must try. I usually eat a lot of salads during Spring and Summer because it’s so refreshing and light!